When outdoor enthusiasts visit Tioga County, Pennsylvania, most head straight to the amazing Pennsylvania Grand Canyon. And while there is no question that the PA Grand Canyon is stunning, there are plenty of other great places to explore in this region of the state. One perfect example is the fantastic Sand Run Falls. 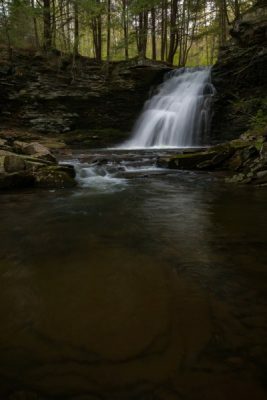 Sand Run Falls is located near the small community of Arnot in Tioga State Forest. This beautiful waterfall, roughly 25 feet in height is set far from any road. However, despite the 6-mile roundtrip hike needed to see it, it’s quite a popular location for hikers, photographers, and fishermen.